https://www.wowace.com/projects/inspectequip-3 taking over maintaining this addon so people can get updates for it. I'll open a Github Repro. Maybe we can make this work together again. Just wondering if there's going to be an updated version for Legion?!? FWIW, I just tested, modifying an existing item link to be marked as Warforged causes GetItemInfo() to return the modified item level, so AFAIK the item levels should all be correct. Can you give me an example item link for a Thunderforged / Warforged item that isn't handled properly? Item levels are handled by my addon LibItemUpgradeInfo-1.0. I know Warforged is done with a new Bonus ID system, but I don't have any such items to test myself. Thunderforged and Warforged items don't seem to get detected by the addon. Can the item database is divided into two parts, one containing classic WoW to Burning Crusade, the other part contains the Lich King to Cataclysm, or simply as part of the Cataclysm independent. This can reduce the resource consumption, because as more and more database objects, this addon will be more fat, so that players can load their own needs with the database, if so it is perfect. The items you linked show the correct source for me... For the belt you can try to reset the database in the InspectEquip options, since that item should come from the encounter journal. I hope that works. Concerning gem checks: I didn't have time to include that yet. The main reason why I didn't include it previously was that the gem information is (or at least was when i last checked) not yet immediately available when inspecting. At least I had that problem with the Examiner integration. Therefore, this will require quite a bit of testing, because I don't wan't to incorrectly label all items as missing gems. Reforging: Yeah, I will include that, too. eggsampler also posted code for that, but I don't like the solution of just displaying the first 2-3 characters of the stat name, because that doesn't work well with international versions. The full stat names are too long. A possible solution would be to add short forms (i.e. Int, Crit) to the localization database. I don't know if there is a better solution, but I wanted to check if something like this is already available. Missing belt buckle: Thanks, will look at that. Hi emelio, have you ever thought about using the encounter journal for some of the new 4.3 raid/dungeon items? Hey everyone. I have just uploaded a first alpha version of the next InspectEquip release. This version comes with some pretty big changes, so it may still contain some bugs. In general, the tooltip shows how the item can be obtained right now, not how it might have been obtained by the player. The item price represents the current price. This will be updated with each patch, so for example items that could be bought using Valor Points in Patch 4.1 are now listed with their new Justice Point price. The way tokens and upgraded items are handled has changed. Items that are bought from a vendor are now listed under the vendor category. This includes T-set items that are bought in exchange for a token that drops from a raid boss. All items that are required to buy an item (i.e. tokens, points, non-heroic items) are listed in the tooltip, including source information for these items. Therefore, the information about the token drop location can still be found in the tooltip. Also, heroic upgrade items are supported, including the full item cost (e.g. token + non-heroic item). 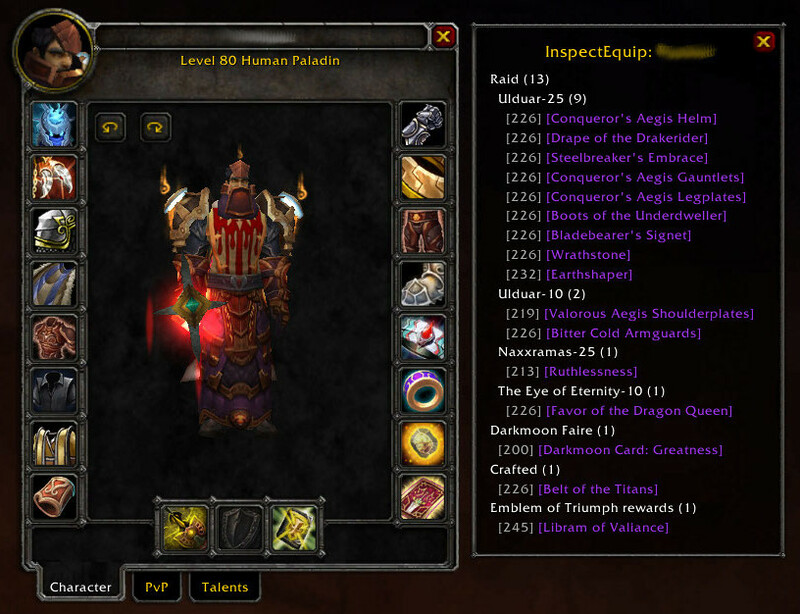 All items bought from a vendor (including Justice/Valor/Honor/Conquest items) are now in the vendor category. This also means that the PvP category has been merged into the vendor category. Heroic zones don't use a separate category anymore. Detailed drop information is available in the tooltip (this is not yet implemented, but will be added soon). For items that are looted from chests etc., the name of the chest is currently displayed instead of the boss name. I plan to fix this, but it may take some time. Some items don't have boss information, even though they only drop from one boss. This mostly affects some tokens. There are still some items missing in the database. Here is a list of currently missing items that I am aware of. If you find other missing items, I would appreciate a report. These changes are currently only available as an alpha version (i.e. only on Wowace or using the Curse Client). When I have added some more items, I will release a beta version. Note that 4.3 items are currently not included, but the addon works fine on 4.3 (in fact, the TOC is updated to 4.3, so "Load out of date addons" needs to be enabled if you want to try the alpha version on 4.2). The database will be updated to 4.3 after the patch is released. http://www.wowhead.com/item=67146 and most world drops & raid trash drops are not listed. http://www.wowhead.com/item=62050 marked "unknown" as well instead of crafted. if you open the characterpanel, <c> , you should see a frame with your own items attached on the right side of the panel. I love the listing of the items. How can we see this list of items for our own player? Can you do a self-inspect? I'd like to see it for what I have currently equipped, and maybe even see a list like that for each equipment set I have. If I have to equip first, that would be ok, but a bit more cumbersome. i don't think heroic items arent as important for raids yet as you make it look like. I'm working on it. I hope to have a version with most of the new items ready in the next few days. Can't promise it will be complete though. Since I can't use the armory anymore I have to rely on Wowhead. Unfortunately their data isn't complete, for example they don't have drop information for heroic raid items.